This is the second in a series of articles on adoptable cats at AdoptaPet.com. You can find current cats and their stories on the website if you are looking for new friend or a friend to add to your home. You can search for cats in your local area by zip code. And of course you can specify that you want a Siamese. And you know what? I think Siamese are the best! 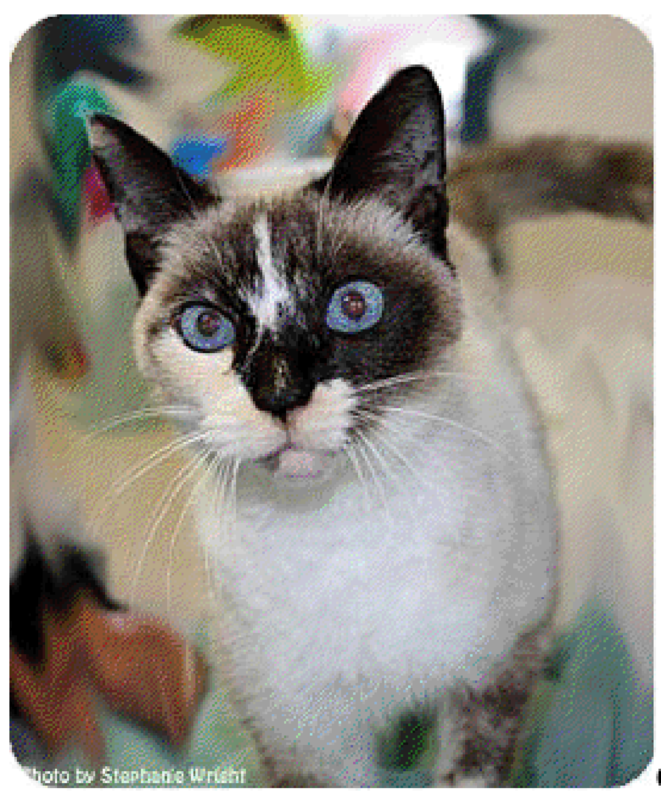 Cinnamon is a sweet older kitty with the most striking eyes and personality. This Siamese mix is around five years of age and has the brightest blue eyes anyone has ever seen. Her fur has the consistency of a plushie toy, and along with the Siamese coloring, she has additional cream coloring as well that makes her unique and absolutely stunning. This kitty was left at the shelter with several kittens, and now that they have been adopted, it’s her turn! She has gained a ton of weight and has been spayed so she’s all ready to find the loving home she deserves. She came to the shelter declawed, and has come to trust her caretakers fully, unlike some declawed felines. When you’re having a bad day, Cinnamon will ask about what happened. When you come in the door, Cinnamon will greet you loudly. When you sing your favorite song, Cinnamon will sing too! She loves to talk and loves to chat with just about anyone, and always greets new visitors warmly. She loves absorbing all of the attention in the room, and will be a great hostess to your guests! This series is a series of Siamese cats that are up for adoption at Adopt A Pet. This link, of course goes directly to the Meezers. If you’d like to help out, check out their site and see who else is looking for a new person to serve them! And how could anyone resist them? Look at Ming Lee for example. Ming Lee is a doll and a half! 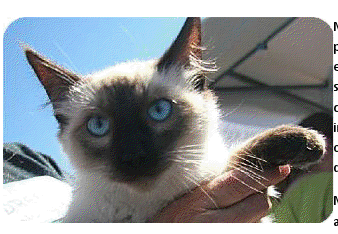 This charming seal point Siamese kitty has the most charming blue eyes you’ve ever seen. Weighing in at about six pounds at six months, Ming Lee is a huge charmer. He’s “flirty” – he doesn’t love getting in your face, but he does love lying next to you or rubbing up against you as you come in the door from a long day of work. Ming Lee was abandoned on the streets in an area that was loaded with coyotes. It wasn’t long until this intelligent feline found a local rescuer and took up residence under her house. He greeted her every morning, day after day, and eventually she couldn’t help herself and brought him inside. Now that he’s neutered and has his shots all updated, he’s ready to find a home that will admire him for the beautiful cat he is. This cat is all love and needs a big house with a ton of love. He’s got a big, Siamese personality, and needs the space in a house to spread his wings and flourish. Kid friendly, dog friendly, cat friendly – this cat is all you could possibly need in one!